President Muhammadu Buhari of Nigeria declined business overtures from former Prime Minister of United Kingdom, Tony Blair, an extract from the explosive new biography by investigative journalist, Tom Bower has revealed. According to the book, Blair benefited from classified British security information while touting for lucrative business contracts from foreign governments. Bower, whose account is based on exclusive interviews with Cabinet ministers, mandarins and other senior sources, said Blair made an attempt to sell Israeli drones to Nigeria. 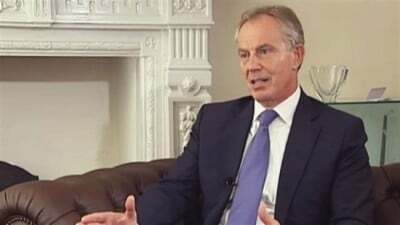 “Upon leaving office in 2007, Mr Blair set up several charities, including the Faith Foundation and the Africa Governance Initiative (AGI),” the book said. In May 2015, Mr Blair flew to Nigeria to meet the new president, Muhammadu Buhari, on a jet chartered by Evgeny Lebedev, the son of a former KGB colonel who owns the London Evening Standard newspaper. The next day, he visited the British High Commissioner for a comprehensive security briefing on the threat posed by the Islamic terror group Boko Haram. Armed with this secret information, Mr Blair then visited Mr Buhari’s offices, ostensibly for AGI to set up a so-called Delivery Unit for the president. In fact, says Bower, he spent 20 minutes touting for business on behalf of his private company, Tony Blair Associates – offering to sell the president Israeli drones and other military equipment to help defeat Boko Haram. Mr Buhari is said to have complained: “Blair is just after business”. o sought security briefings in other British embassies – as well as accommodation for the night. Last night a spokeswoman for Mr Blair said the claim he used classified security information to tout for business was “utterly without substance”. She said Mr Blair’s work in Nigeria was for his charities, adding that: “He has never sought a business contract from the government of Nigeria. “Yes, he certainly has had briefings on Boko Haram. He is very interested in Boko Haram because it concerns directly the work of his foundation which is about countering extremism. “He didn’t “demand” a salary from J P Morgan. His work as chairman of their International Advisory Council is a matter of public record. “It is true that some of those around the Palestinian leadership have been critical of Mr Blair. That is because he disagrees strongly with them over their political strategy. However, there are many other Palestinians with whom he works closely and well.